During the past couple of weeks, I have to admit I was putting in some “extra hours” to push my game to a level that hopefully could have competed with the big boys. One of my practice sessions was right after one of our school days. 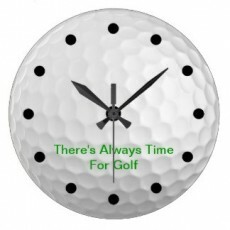 Typically, after a day of teaching I’m too tired to put in a good practice session, but due to the circumstances – possibly getting a call to get in the PGA Championship anytime – I put in the “after hours” practice. During one of my post-school sessions, one of our students asked me if he could sit and watch my session. I never have a problem with anyone wanting to learn more, and gladly entertained the company. During the middle of the practice session, it became very apparent I needed to write more about how I practice, as the student kept telling me, you need to teach this, show this. So guess what this e-tip is about? But I have put a little different take on it. 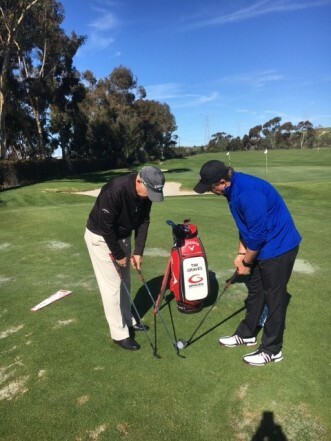 As I was talking to my student – I began to describe my “advantages” over the average golfer in my practice sessions. In other words, how I have set up my practice sessions to give me the “no excuse”, or “least amount of variables” type of practice. How do I set up my practice sessions with the least amount of doubt during the session? So, as you haven’t seen me on my “soapbox” for a while; if you are new to our e-tips, you have never seen my “soapbox”, I thought it was about time, and I am writing this as an “advantage me” type situation. You’ll understand more as I get into detail, read on. 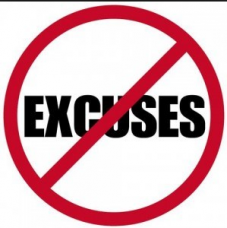 This is my NO EXCUSE Attitude. I have always made it a very specific point to give myself every advantage when I practice. I heard this for the first time in 1996 when I was playing in the U.S. Amateur against Tiger Woods. I remember an interview he was giving to ESPN on the range and he stated (paraphrasing) “When I (Tiger) practice, I set up a situation when no one has an advantage over me” – meaning, when Tiger practices he makes sure all the details are covered, there are a few variables as possible, etc… I’ll explain by describing my practice session I was holding with our student watching. As I go through my practice session, think, and better yet write down how many of the points you do EVERY TIME, not some of the time, or most of the time, but EVERY TIME. Be honest with yourself – the more honest, the better. First, before I start every practice session – I stretch. To be honest, probably not enough, but I put in at least 5 minutes of stretching. Making sure not to forget about my wrists and shoulder blades. I stretch with my training 6 iron in hand so when I hold the club to stretch I have the training grip in hand. Note: If you begin your practice session tight – you will be hurting your swing – guaranteed – good luck getting into correct positions when you are tight. I also “kill two birds with one stone” as stretching always involves a few “air swings” or golf swings without a golf ball. I want to make sure my grip is perfect, and with my training club, I don’t have to think about it – no brainer. Second – How many golf balls do you hit during practice. In other words, do you have a “limited” number of golf balls? I am going to eventually write an article for the PGA titled how “Country Club members have an advantage over the typical golfer”, not because of the course, but because of the unlimited range balls. I’ll explain. After I stretch, I begin to hit my wedges. In fact, I hit a lot of wedges. Lob, sand, pitching, etc… I start with very short shots, maybe 30 to 40 years, and then work up to a full pitching wedge – I typically hit at least 20 to 30 balls minimum with my wedges to warm up my swing, start getting the club on plane with short easy swings is much easier than getting to the mid to long clubs too fast. Here is the issue – with a limited number of golf balls, like a small range bucket, I promise you, you will be hitting drivers in just a few golf balls. You will not spend enough time on the wedges – which is where the warm-up should and must begin. Hit a lot of wedges. If it is a cost issue for you, figure out a way to hit balls and shag them, find a pitching green to begin your practice, figure out something, give your wedges more time. 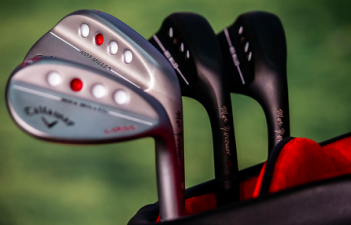 So – if you aren’t spending a good amount of time warming up your practice session with your wedges – ADVANTAGE ME. Third – My clubs – this is an easy 0ne – but one missed by so many golfers. When I practice I have NO DOUBT my clubs fit me PERFECT! Why is this important – because it gives me a no excuse for the club’s attitude. In other words, if I hit a ball left, it wasn’t due to the club (improper fit), if I hit it right (not due to the club), too high (not the club), etc… etc. I think you get the point. Too many golfers have club issues – clubs that don’t fit their swing. They may swing at it perfectly, but as the club doesn’t fit their swing, the lie angle pulls the ball left or pushes the ball right (vice versa for lefties) and their mind tells them there is a swing issue – when it is really a club issue. So many aren’t able to release the club because their grip size is too big and don’t know it. This causes SO MANY problems having grips that are too big. Thirdly, I have NO DOUBT about my clubs – the fit me for a lie, length, grip size, shaft flex, and the most important playability (for my ability) and a good feel for my game. So – if you clubs might not fit you or you’re are uncertain about your club fit – ADVANTAGE ME. Fourth – This may be the most important. I use an Alignment Aid EVERY TIME I practice – yes, even when I am warming up for a tournament, I put an alignment training aid on the ground. To be honest, this is probably the issue the disturbed me the most when I watch average golfers practice. Why? Because it is so simple, and has such BIG effects – and so few use it. Too lazy? Don’t know the importance? Who knows? But a HUGE problem! I lay the alignment aid pointed toward the target and put a yardstick under the training aid. So simple – look at all the variables I have solved using this SIMPLE tool EVERY TIME. I promise you, I will never hit a practice ball without an alignment tool. So – if you aren’t using an alignment aid every time you practice – ADVANTAGE ME. In fact – let’s say HUGE ADVANTAGE ME. In fact, soapbox time, if you aren’t using an alignment aid every time you practice, don’t read further…. no need – you have so many variables right now without using one… no need to continue to read… you won’t get past fixing all those listed above… Alignment, ball position, stance, square club face, distance to the ball…. enough said. You will go back and forth, back and forth, back and forth fighting these issues FOREVER – I will NEVER have these issues – why because I take the extra couple of seconds to lay an alignment tool down every time I practice. Fifth – I never practice for more than 15 minutes at a time. In other words, I hit 15 minutes’ worth of golf balls and then take a break. Might sit down for a minute or two to drink some water, might make a phone call, might walk over to the putting green and hit a few putts… you get my point. Why? Because I give my body and more importantly, my brain, a break. None of us can focus longer than 12-16 minutes, it’s a proven fact. And as you are working on your swing (hopefully specific issues in your swing), you need to focus. So – if you are practicing for more than 15 minutes in a row (without taking a break) – ADVANTAGE ME. Many of you might think I video and check my swing every day. Couldn’t be further from the truth. To be honest, at most, I video my swing maybe once a week – more often, once every two weeks… I get enough from a single video session to work on for at least a couple of weeks. What can you do? Check out our GGA Internet Golf Academy – you can do EXACTLY what I do. Send in a video every couple of weeks – we’ll give you plenty to work on. In summary – be honest with yourself. How do you rate your practice sessions compared to what I wrote above? How many advantages do I have over you? Remember – there is a DIRECT correlation between the time it takes to get better to the number of “advantages” you have. Don’t leave ANYTHING to chance…. every second I practice I am assured I am getting better – I eliminate as many variables as possible. To end – Folks, it’s not hard… in fact, it is very very simple and easy. Go through the list above again and make sure I have NO Advantage over you when we practice. Remember – Always Practice with a Purpose!